Each instance of the Module class corresponds to a single AST file, which may be a precompiled header, precompiled preamble, a module, or an AST file of some sort loaded as the main file, all of which are specific formulations of the general notion of a "module". A module may depend on any number of other modules. Definition at line 107 of file Module.h. Definition at line 109 of file Module.h. Definition at line 25 of file Module.cpp. Dump debugging output for this module. Definition at line 47 of file Module.cpp. Definition at line 130 of file Module.h. Determine whether this module was directly imported at any point during translation. Definition at line 473 of file Module.h. Definition at line 476 of file Module.h. References dump(), clang::serialization::MK_ExplicitModule, clang::serialization::MK_ImplicitModule, and clang::serialization::MK_PrebuiltModule. Referenced by clang::ASTReader::getModuleFileID(), clang::ASTReader::getModuleImportLoc(), isDiagnosedResult(), clang::ASTRecordReader::isModule(), clang::ASTIdentifierIterator::Next(), clang::ASTReader::ReadPragmaDiagnosticMappings(), clang::ASTReader::ReadSLocEntry(), clang::ASTReader::resolvePendingMacro(), and clang::RewriteIncludesAction::RewriteImportsListener::visitModuleFile(). The actual original source file name that was used to build this AST file. Base declaration ID for declarations local to this module. Definition at line 415 of file Module.h. Referenced by AddLazyVectorDecls(), clang::ASTReader::isDeclIDFromModule(), and isDiagnosedResult(). The base directory of the module. Definition at line 128 of file Module.h. Referenced by isDiagnosedResult(), clang::ASTReader::ResolveImportedPath(), and clang::ASTReader::resolvePendingMacro(). Base identifier ID for identifiers local to this module. Definition at line 275 of file Module.h. Referenced by AddLazyVectorDecls(), and isDiagnosedResult(). Base macro ID for macros local to this module. Definition at line 311 of file Module.h. Base preprocessed entity ID for preprocessed entities local to this module. Definition at line 330 of file Module.h. Referenced by AddLazyVectorDecls(), clang::ASTReader::isAcceptableASTFile(), and isDiagnosedResult(). Base ID for preprocessed skipped ranges local to this module. Definition at line 339 of file Module.h. Referenced by isDiagnosedResult(), and clang::ASTReader::ReadSkippedRange(). Base selector ID for selectors local to this module. Definition at line 383 of file Module.h. Base submodule ID for submodules local to this module. Definition at line 366 of file Module.h. Referenced by AddLazyVectorDecls(), clang::ASTReader::getModuleFileID(), clang::ASTReader::isAcceptableASTFile(), and isDiagnosedResult(). Base type ID for types local to this module as represented in the global type ID space. Definition at line 455 of file Module.h. The memory buffer that stores the data associated with this AST file, owned by the InMemoryModuleCache. The serialized bitstream data for this file. Definition at line 187 of file Module.h. 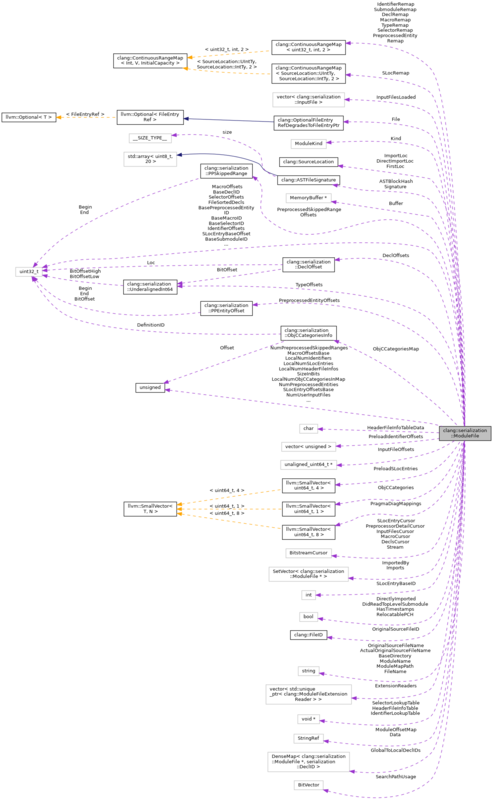 Offset of each declaration within the bitstream, indexed by the declaration ID (-1). Definition at line 412 of file Module.h. Remapping table for declaration IDs in this module. Definition at line 418 of file Module.h. Referenced by clang::ASTReader::getGlobalDeclID(), and isDiagnosedResult(). It has read all the abbreviations at the start of the block and is ready to jump around with these in context. Referenced by isDiagnosedResult(), clang::ASTRecordReader::readLexicalDeclContextStorage(), clang::ASTReader::ReadSubExpr(), and clang::ASTRecordReader::readVisibleDeclContextStorage(). The source location where the module was explicitly or implicitly imported in the local translation unit. If module A depends on and imports module B, both modules will have the same DirectImportLoc, but different ImportLoc (B's ImportLoc will be a source location inside module A). WARNING: This is largely useless. It doesn't tell you when a module was made visible, just when the first submodule of that module was imported. Whether this module has been directly imported by the user. Definition at line 171 of file Module.h. The list of extension readers that are attached to this module file. Definition at line 211 of file Module.h. The file entry for the module file. Definition at line 163 of file Module.h. Referenced by clang::ASTUnit::getPCHFile(), clang::ASTReader::isAcceptableASTFile(), and clang::GlobalModuleIndex::loadedModuleFile(). The file name of the module file. Definition at line 122 of file Module.h. Referenced by AddLazyVectorDecls(), clang::ASTUnit::getASTFileName(), clang::ASTReader::getSourceDescriptor(), isDiagnosedResult(), moduleKindForDiagnostic(), and clang::ASTReader::resolvePendingMacro(). Array of file-level DeclIDs sorted by file. Definition at line 430 of file Module.h. Referenced by clang::ASTReader::getModuleFileLevelDecls(), isDiagnosedResult(), and clang::ASTReader::ReadSLocEntry(). The first source location in this module. The generation of which this module file is a part. Definition at line 174 of file Module.h. Referenced by clang::serialization::ReadMethodPoolVisitor::operator()(), and clang::ASTReader::ReadDefinedMacros(). The global bit offset (or base) of this module. Referenced by isConsumerInterestedIn(), and clang::ASTReader::ReadAST(). Mapping from the module files that this module file depends on to the base declaration ID for that module as it is understood within this module. This is effectively a reverse global-to-local mapping for declaration IDs, so that we can interpret a true global ID (for this translation unit) as a local ID (for this module file). Definition at line 427 of file Module.h. Referenced by isDiagnosedResult(), and clang::ASTReader::mapGlobalIDToModuleFileGlobalID(). Whether timestamps are included in this module file. Definition at line 157 of file Module.h. Referenced by clang::serialization::reader::HeaderFileInfoTrait::GetInternalKey(), and isDiagnosedResult(). The on-disk hash table that contains information about each of the header files. Definition at line 358 of file Module.h. Actual data for the on-disk hash table of header file information. This pointer points into a memory buffer, where the on-disk hash table for header file information actually lives. Definition at line 354 of file Module.h. A pointer to an on-disk hash table of opaque type IdentifierHashTable. Definition at line 288 of file Module.h. Referenced by isDiagnosedResult(), clang::ASTIdentifierIterator::Next(), and clang::ASTReader::ReadDefinedMacros(). Offsets into the identifier table data. This array is indexed by the identifier ID (-1), and provides the offset into IdentifierTableData where the string data is stored. Definition at line 272 of file Module.h. Remapping table for identifier IDs in this module. Definition at line 278 of file Module.h. Referenced by clang::ASTReader::getGlobalIdentifierID(), and isDiagnosedResult(). Actual data for the on-disk hash table of identifiers. This pointer points into a memory buffer, where the on-disk hash table for identifiers actually lives. Definition at line 284 of file Module.h. List of modules which depend on this module. Referenced by clang::ASTReader::getModuleImportLoc(), getTopImportImplicitModule(), updateModuleImports(), and clang::serialization::ModuleManager::visit(). The source location where this module was first imported. Referenced by clang::TestModuleFileExtension::createExtensionReader(), clang::ASTReader::getModuleImportLoc(), and updateModuleImports(). List of modules which this module depends on. Definition at line 469 of file Module.h. Referenced by llvm::GraphTraits< ModuleManager >::child_begin(), llvm::GraphTraits< ModuleManager >::child_end(), updateModuleImports(), and clang::serialization::ModuleManager::visit(). The index of this module in the list of modules. Definition at line 116 of file Module.h. Offsets for all of the input file entries in the AST file. Definition at line 223 of file Module.h. Referenced by isDiagnosedResult(), and clang::ASTReader::resolvePendingMacro(). The cursor to the start of the input-files block. Definition at line 220 of file Module.h. The input files that have been loaded from this AST file. Definition at line 226 of file Module.h. Referenced by isDiagnosedResult(), clang::ASTReader::resolvePendingMacro(), clang::ASTReader::visitInputFiles(), and clang::ASTReader::visitTopLevelModuleMaps(). If non-zero, specifies the time when we last validated input files. Zero means we never validated them. The time is specified in seconds since the start of the Epoch. Definition at line 236 of file Module.h. Definition at line 119 of file Module.h. Referenced by AddLazyVectorDecls(), clang::ASTUnit::getPCHFile(), getTopImportImplicitModule(), isDiagnosedResult(), moduleKindForDiagnostic(), clang::ASTReader::ReadPragmaDiagnosticMappings(), and clang::ASTReader::ReadSLocEntry(). The number of declarations in this AST file. The number of local HeaderFileInfo structures. Definition at line 347 of file Module.h. The number of identifiers in this AST file. Definition at line 265 of file Module.h. The number of macros in this AST file. Definition at line 301 of file Module.h. The number of redeclaration info entries in ObjCCategoriesMap. Definition at line 438 of file Module.h. The number of selectors new to this file. This is the number of entries in SelectorOffsets. Definition at line 376 of file Module.h. The number of source location entries in this AST file. The number of submodules in this module. Definition at line 363 of file Module.h. Referenced by AddLazyVectorDecls(), and clang::ASTReader::isAcceptableASTFile(). The number of types in this AST file. Definition at line 447 of file Module.h. The cursor to the start of the preprocessor block, which stores all of the macro definitions. Definition at line 298 of file Module.h. Referenced by isDiagnosedResult(), clang::ASTReader::ReadMacroRecord(), and clang::ASTReader::resolvePendingMacro(). Offsets of macros in the preprocessor block. This array is indexed by the macro ID (-1), and provides the offset into the preprocessor block where macro definitions are stored. Definition at line 308 of file Module.h. Remapping table for macro IDs in this module. Definition at line 314 of file Module.h. Referenced by clang::ASTReader::getGlobalMacroID(), and isDiagnosedResult(). The offset of the start of the set of defined macros. Definition at line 317 of file Module.h. Definition at line 151 of file Module.h. Definition at line 125 of file Module.h. Referenced by AddLazyVectorDecls(), clang::ASTReader::getModuleImportLoc(), llvm::DOTGraphTraits< ModuleManager >::getNodeLabel(), clang::ASTReader::getOwningModuleNameForDiagnostic(), getTopImportImplicitModule(), isDiagnosedResult(), clang::GlobalModuleIndex::loadedModuleFile(), moduleKindForDiagnostic(), and clang::RewriteIncludesAction::RewriteImportsListener::visitModuleFile(). If non-empty, the various ContinuousRangeMaps described below have not yet been populated. Definition at line 215 of file Module.h. Referenced by clang::ASTReader::getGlobalDeclID(), clang::ASTReader::getGlobalIdentifierID(), clang::ASTReader::getGlobalMacroID(), clang::ASTReader::getGlobalPreprocessedEntityID(), clang::ASTReader::getGlobalSelectorID(), clang::ASTReader::getGlobalSubmoduleID(), clang::ASTReader::getGlobalTypeID(), isDiagnosedResult(), and clang::ASTReader::TranslateSourceLocation(). Definition at line 431 of file Module.h. Referenced by clang::ASTReader::getModuleFileLevelDecls(), and isDiagnosedResult(). Definition at line 336 of file Module.h. Referenced by AddLazyVectorDecls(), clang::ASTReader::getTotalNumPreprocessedEntities(), clang::ASTReader::isAcceptableASTFile(), and isDiagnosedResult(). Definition at line 342 of file Module.h. Definition at line 230 of file Module.h. Referenced by isDiagnosedResult(), and clang::ASTReader::visitInputFiles(). The Objective-C category lists for categories known to this module. Definition at line 442 of file Module.h. Array of category list location information within this module file, sorted by the definition ID. Definition at line 435 of file Module.h. The directory that the PCH was originally created in. Used to allow resolving headers even after headers+PCH was moved to a new path. Definition at line 149 of file Module.h. Referenced by clang::ASTReader::getSourceDescriptor(), isDiagnosedResult(), and clang::ASTReader::resolvePendingMacro(). The file ID for the original source file that was used to build this AST file. Definition at line 145 of file Module.h. Referenced by isDiagnosedResult(), and clang::ASTReader::ReadPragmaDiagnosticMappings(). The original source file name that was used to build the primary AST file, which may have been modified for relocatable-pch support. Definition at line 137 of file Module.h. Referenced by clang::ASTReader::getOriginalSourceFile(), clang::ASTReader::getSourceDescriptor(), and isDiagnosedResult(). Whether the PCH has a corresponding object file. Referenced by clang::ASTReader::DeclIsFromPCHWithObjectFile(), and isDiagnosedResult(). Diagnostic IDs and their mappings that the user changed. Definition at line 463 of file Module.h. Referenced by moduleKindForDiagnostic(), and clang::ASTReader::ReadPragmaDiagnosticMappings(). Offsets of identifiers that we're going to preload within IdentifierTableData. Definition at line 292 of file Module.h. SLocEntries that we're going to preload. Definition at line 257 of file Module.h. Referenced by isDiagnosedResult(), and clang::ASTReader::ReadAST(). Definition at line 335 of file Module.h. Remapping table for preprocessed entity IDs in this module. Definition at line 333 of file Module.h. Referenced by clang::ASTReader::getGlobalPreprocessedEntityID(), and isDiagnosedResult(). Definition at line 341 of file Module.h. The cursor to the start of the (optional) detailed preprocessing record block. Definition at line 323 of file Module.h. The offset of the start of the preprocessor detail cursor. Definition at line 326 of file Module.h. Whether this precompiled header is a relocatable PCH file. Definition at line 154 of file Module.h. A pointer to an on-disk hash table of opaque type ASTSelectorLookupTable. This hash table provides the IDs of all selectors, and the associated instance and factory methods. Definition at line 398 of file Module.h. Referenced by isDiagnosedResult(), and clang::serialization::ReadMethodPoolVisitor::operator()(). A pointer to the character data that comprises the selector table. The SelectorOffsets table refers into this memory. Definition at line 391 of file Module.h. Offsets into the selector lookup table's data array where each selector resides. Definition at line 380 of file Module.h. Remapping table for selector IDs in this module. Definition at line 386 of file Module.h. Referenced by clang::ASTReader::getGlobalSelectorID(), and isDiagnosedResult(). The signature of the module file, which may be used instead of the size and modification time to identify this particular file. Referenced by clang::ASTReader::getSourceDescriptor(), clang::ASTReader::isAcceptableASTFile(), and moduleKindForDiagnostic(). The size of this file, in bits. Definition at line 181 of file Module.h. The base ID in the source manager's view of this module. Definition at line 247 of file Module.h. Referenced by isDiagnosedResult(), clang::serialization::reader::ASTDeclContextNameLookupTrait::ReadDataInto(), and clang::ASTReader::ReadSLocEntry(). The base offset in the source manager's view of this module. Definition at line 250 of file Module.h. Referenced by AddLazyVectorDecls(), isDiagnosedResult(), and clang::ASTReader::ReadSLocEntry(). Cursor used to read source location entries. Definition at line 241 of file Module.h. Referenced by clang::serialization::reader::ASTDeclContextNameLookupTrait::ReadDataInto(), and clang::ASTReader::ReadSLocEntry(). Offsets for all of the source location entries in the AST file. Definition at line 254 of file Module.h. Referenced by isDiagnosedResult(), and clang::ASTReader::ReadSLocEntry(). Definition at line 260 of file Module.h. Referenced by isDiagnosedResult(), and clang::ASTReader::TranslateSourceLocation(). The main bitstream cursor for the main block. Referenced by clang::ASTReader::isAcceptableASTFile(), isDiagnosedResult(), moduleKindForDiagnostic(), parseModuleFileExtensionMetadata(), clang::ASTReader::ReadAST(), and clang::serialization::reader::ASTDeclContextNameLookupTrait::ReadDataInto(). Remapping table for submodule IDs in this module. Definition at line 369 of file Module.h. Referenced by clang::ASTReader::getGlobalSubmoduleID(), clang::ASTReader::isAcceptableASTFile(), and isDiagnosedResult(). Offset of each type within the bitstream, indexed by the type ID, or the representation of a Type*. Definition at line 451 of file Module.h. Remapping table for type IDs in this module. Definition at line 458 of file Module.h. Referenced by clang::ASTReader::getGlobalTypeID(), and isDiagnosedResult().